Chase Budinger has endured knee issues for much of the past two seasons, but he feels confident his return to legitimate action could be around the corner. 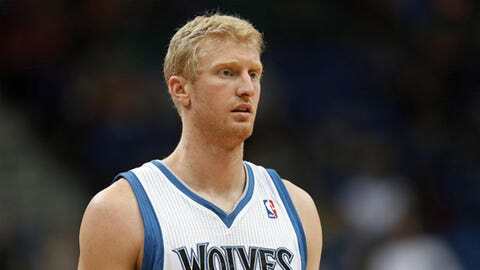 MINNEAPOLIS — Chase Budinger learned not to rush rehabilitation the first time around. But that doesn’t prevent him from salivating at the possibility of making his Timberwolves return, especially after days like Thursday. "I definitely get the urge of wanting to get back and to start playing," said Budinger, who practiced at full capacity for the first time this season after being cleared to do so Wednesday, "but I know I’ve got to take my time." It has been a long year for the small forward, dating back to last season when he tore the meniscus in his left knee the first time. He underwent surgery and missed 59 games but was able to return March 21, only to reinjure the same knee tissue while preparing for training camp this season. A second operation, 2 Â½ months of rehab in Pensacola, Fla., and several limited, shooting-based workouts since rejoining the team Nov. 18 finally have him on the cusp of returning. The trick now is getting the rest of his body back to playing shape. The knee hasn’t experienced any swelling, but his conditioning isn’t yet up to par with that of his teammates, who have been playing in NBA games for a month-and-a-half now. "The biggest thing I felt today was the bottom of my feet," Budinger said. "Halfway through out there, my feet were starting to burn. That’s just something that you’ve got to get used to again." Minnesota spent a good chunk of Thursday’s practice in 3-on-3 and 4-on-4 situations, giving Budinger a chance to test his knee under game-like circumstances. He didn’t favor it or think about it much, he said. There is no team-issued timetable for Budinger’s return to game action. He plans to work out on his own in his hometown of San Diego next week when the Timberwolves take some time off for Christmas. Getting back on the floor and shoring up Minnesota’s wing depth would certainly be a nice gift before the New Year. "The only good thing is I’ve been through this process before," Budinger said, "so I kind of know what to expect." Coach Rick Adelman also said shooting guard Kevin Martin and forward Dante Cunningham looked good during practice Thursday. Martin missed Monday’s game at Boston but started in Wednesday’s victory over Portland and scored 22 points in 36 minutes, 41 seconds of action. Cunningham rolled his ankle late against the Celtics but played 26:09 and had four points and seven rebounds Wednesday. "That was a good sign that those two guys played," Adelman said. "I didn’t think either one of them would play." Shved shows improvement: Alexey Shved is pleased with his recent surge, one that has had some observers asking lately who the heck that kid wearing No. 1 is. "I feel much better right now," the reserve guard said. After starting off his second NBA season with a horrendous 20-percent shooting clip and general lack of candor or contribution, Shved has been almost a different young man the past four games. In that recent stretch, he has made 9 of 19 field goals, dished out six assists and pulled down seven rebounds. Wednesday against Portland, he contributed to a dominant second-quarter run with a high-flying one-handed dunk and an equally electric alley-oop lob that Cunningham flushed home. It’s those kinds of spot contributions Adelman thinks Shved can deliver consistently, even after his nightmarish first month-and-a-half of the season. "He’s continued to stay with it," the coach said of Shved, who scored a season-high 10 points Monday at Boston. "I just think he’s been much more active the last two or three games. I told him that today. He just needs to be aggressive." Said the soft-spoken Russian himself: "I just need to work and play good. If I play good, I play more minutes." Christmas plans: The Timberwolves flew out of St. Paul on Thursday for a two-game, Los Angeles-based road swing — Friday against the Lakers at 9:30 p.m., Saturday against the Clippers at 8:30 p.m.
They’ll then have Monday, Tuesday and Wednesday off next week off before returning to practice Thursday. Their game schedule resumes with a home clash against Washington on Friday, Dec. 27.